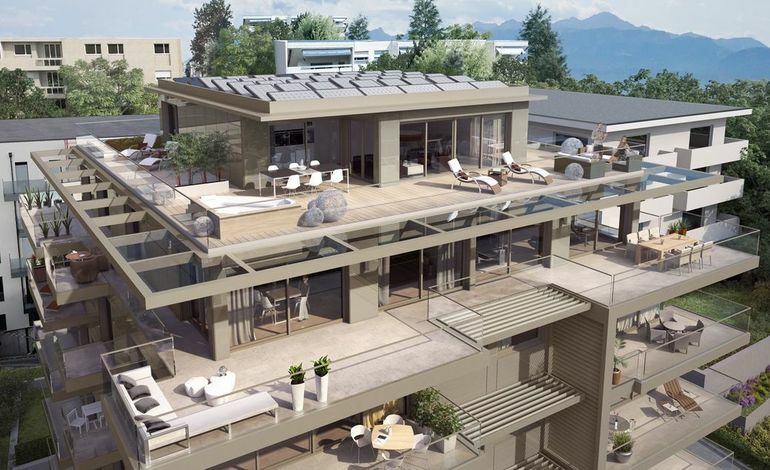 This brand new buidling, named 16 Beau-Rivage, is located just a stone’s throw from the shores of Lake Léman. This luxurious, elegantly-styled, real estate development is an architectural gem. Ideally located next to the nearby famous Beau-Rivage Palace, it is sure to enchant the most discerning connoisseurs. The residence comprises fourteen 2.5 - and 4.5 - room apartments with spacious balconies over seven floors. 16 Beau-Rivage is designed to perfectly fit its setting. Its premium-class finishes, fashioned using state-of-the-art technology, its exceptional materials, blending harmoniously with its contemporary, understated style, were meticulously selected to ensure this property would be exquisite, enduring, aesthetically-pleasing and comfortable. Pragmatic, 16 Beau Rivage offers extensive living spaces, large individual cellars, an expansive lobby and an adjacent communal area, comprising individual wine cellars and kitchenette. Its acoustic insulation capacities are of the highest quality. Apartments are all south-facing with large bay windows, offering ideal exposure to light throughout the day. Your future home, perfectly integrated right in the heart of Ouchy by the architect Gabriele Rossi and developed by Norwood, comprises glass façade which guarantee excellent constructional longevity and ensure the building is at one with its natural and urban setting. To this end, the reflection of Beau-Rivage’s tree-covered park on the glass façade conveys a feeling of lightness and elegance. Metallic finishes on the glass structure enhance the property’s contemporary style and quality. Moreover, solar and photovoltaic panels provide the most-welcoming eco-friendly heating.